Godfrey Chitalu (22 October 1947 in Luanshya, Northern Rhodesia – 27 April 1993 in the Atlantic Ocean, off the coast of Gabon) was a Zambian footballer who is widely regarded as the greatest Zambian player ever as he holds his national team scoring record and was voted Zambian footballer of the year five times. Also, he was the first member of the intergalactic football league (IFL), gaining historical success with his multiple goals for Beyond Life F.C  As well, he was selected by CAF as one of the best 200 African footballers of the past 50 years in 2006. Chitalu scored more than 100 goals in all competitions in 1972, more than Gerd Müller's total in 1972 and Lionel Messi's total in 2012, both of which are often referred to by journalist as "world records". However, Zambian researchers found out they were actually 116 throughout the calendar year. This includes 15 goals in CAF competitions, 91 goals in FAZ tournaments, 5 goals in friendly games, 3 goals in the NFL Trophy and 2 goals in the NFL Benevolent Fund Match. The research was presented in the year 2012 after Lionel Messi broke the alleged world record of Gerd Müller. Nevertheless, a FIFA spokesman declared that an official FIFA world record had never existed as they did not keep track of domestic competitions. Chitalu was born in Luanshya, in the Copperbelt Province, in a tough neighbourhood called Mikomfwa where the youth got involved in various vices besides playing barefoot football. It is believed that these early experiences helped to shape his character. He studied in Mikomfwa and managed to get a place in the school team at the age of 10. Shortly afterwards, he was surprised when the Recreation Officer, Benny Evans, invited him to Fisansa Youth Club for a trial after which he started playing for the team as a center-forward. Even though competition was stiff, Chitalu got into the under-15 district team and travelled to Bulawayo with the squad in 1958 as a reserve player and also took part in boxing. In 1959 he got a transfer to Kawama School in Kitwe where he switched his position to inside-left and became a regular first team player. While at Kawama School, he joined the Kwacha I Community Centre team where he played at centre-forward. During his 3 years at the centre, Kwacha I remained champions in Kitwe District. Chitalu's talent was noticed by a club trainer called Tirivavi, who encouraged him to concentrate on playing football and forget about boxing so he hung up his gloves conditioned too by the fact that not many boys of his age were interested in the sport. In 1962, he completed his primary education and left Kitwe. He went to stay with his elder brother in Chingola and continued his studies at Mushishima Secondary School and played for the school team at inside-left. Chitalu returned to Kitwe and Kwacha I in 1964 and then joined the Kitwe United reserve team after being spotted by chairman Jethro Ngwane who was looking for young talent for his team. Chitalu spent much of the 1965 season in the reserves and was promoted to the first team at the end of the season, scoring on his debut against Rhokana United in United's last game of the season. Kitwe skipper, Emment Kapengwe, encouraged him to continue playing football. The strong and aggressive teenager, who admired the Scottish striker Denis Law, showed plenty of skill but also had a reputation for being temperamental and rough. In his own words, "he could not stand being booted without retaliation". The following season Chitalu, now wearing the number 10 shirt for United, cemented his place in the side and was one of its leading scorers although the team could only manage a sixth-place finish. In June 1967, Zambia played three exhibition matches against the touring John Charles XI and Chitalu's performances in the matches caught the attention of Cardiff City but the anticipated offer of a contract did not materialise. On 8 July 1967, he made the headlines for the wrong reasons when he was sent off in a league match against City of Lusaka at Woodlands Stadium in Lusaka. After being warned several times for rough play, he was finally booked by the referee but Chitalu gave his name as Denis Law and this earned him a sending off. He refused to leave the pitch and had to be escorted off by a United official. As he was already on a warning for bad behaviour, the disciplinary committee of the Zambian NFL came down hard on him and suspended him for the rest of the season for giving the referee a false name. The following year, Chitalu was named club captain in a move which the media described as "the best move ever made – or the worst". At 20, this made him the youngest captain in Division I and the club felt that by being named captain, he would be forced to control himself so that he could control his players. Chitalu responded that it was a bit tricky for him but he was ready for the challenge and did not want to let the team down. He said each time he had committed an offence in the past, he used to question the referee but Kitwe United officials had been responsible for changing his character. The move appeared to work as Chitalu's disciplinary record improved and he scored 81 goals for club and country to win the inaugural Footballer of the Year and Top Scorer awards with Kitwe United finishing fourth on the table. United even reached the final of the Castle Cup which they lost to league champions Mufulira Wanderers 2–1. In June 1969, Chitalu was in trouble with the authorities yet again when he was fined and suspended for six weeks after being sent off in an exhibition game between Zambia and Cardiff City, for hacking Cardiff defender Brian Harris. The ban was later lifted by the Football Association of Zambia after an apology. Four months later, he was suspended for six months for leaving the national team's training camp without permission, despite his explanation that he was unwell and had gone to seek treatment from his doctor in Luanshya. Chitalu returned to action in the year 1970 after serving five months and missing the first month of league games. He managed to stay out of trouble and won the Chibuku Cup with Kitwe United in a 1–0 victory over Kabwe Warriors in Kitwe. At the end of the season, he picked up his second Footballer of the Year award and finished third on the top scorers list behind leading scorer Sandy Kaposa and runner-up Boniface Simutowe. In 1971, Chitalu moved to Kabwe with the intention of joining Kabwe Warriors. At first, Kitwe United tried to pour water on the move by saying they would not release him as Warriors had "caught a fish in the wrong waters". Kitwe United then slapped a transfer fee of K15,000 which was more than seven times the record fee in Zambian football of K2,000. Chitalu appealed to the National Football League and the transfer was eventually given the green light at a reduced fee of K3,500. After missing the first six games of the season, Chitalu scored a hat-trick in his first game, against Kalulushi Modern Stars. It was in this year that he started going by the nickname "Ucar" after the long lasting Ucar batteries manufactured by Union Carbide. He won the league and Chibuku Cup double in his first season at Kabwe Warriors and ended the year as top scorer with 51 goals for club and country. Chitalu kicked off the 1972 season by scoring a brace when Warriors drew 2–2 with Majantja FC in Maseru in the African Cup of Champions Clubs on 23 January 1972. He followed this up with a lesson in clinical finishing, scoring seven goals when Warriors overwhelmed the Sothos 9–0 in the second leg on 6 February 1972 at Dag Hammarskjöld Stadium in Ndola. Although the newspaper reports of the match stated that he had set the pace on the scoring charts with nine goals in the competition, the goals were later scratched off by the Zambian authorities because the two matches were played before the Zambian season had gotten underway. Chitalu scored the winner when Warriors beat Kitwe United 1–0 to win the season-opening Charity Shield and scored twice when Warriors trounced Zambia Police 5–2 in their first league game of the season at Railways Stadium in Kabwe. He scored a hat-trick when Warriors beat Maseru United 7–1 in an international friendly at the same venue in March and 4 goals in a 14–2 thrashing of Norco Rangers in a Chibuku Cup first round match to pull away from the rest of the field. He was also on target for Zambia in an international friendly against Sheffield United in May. When Zambia met Lesotho in a FIFA World Cup qualification game in June, he struck twice in a 6–1 victory and was also on the score-sheet in friendly matches against Union Española of Chile. Chitalu scored a brace when he captained the All Stars to a 4–3 victory against The Rest on 14 August, taking him to 71 goals for the season. Chitalu scored twice in the Zambian Challenge Cup final when Warriors beat Ndola United 3–1 and scored in another final two weeks later, this time in the 5–3 defeat of Rhokana United in the Chibuku Cup final. In the process, he surpassed his own record of 81 goals that he had set as the inaugural winner of the Top Scorer awards back in 1968. At the end of October, Chitalu had amassed 92 goals with a gap of 57 goals between him and second placed Bernard Chanda of Mufulira Wanderers and his teammate Sandy Kaposa. He went on to score in 17 consecutive matches for Warriors, including two when they were knocked out of the African Cup of Champions Clubs 9–3 on aggregate by Ghana's Hearts of Oak, 5 against Buseko FC in a Chibuku Cup tie, 5 against Roan in a Castle Cup semi-final and 7 against Mufulira Wanderers in two league games including 4 in a 5–1 demolition at Shinde Stadium. He scored in yet another cup final when Kabwe Warriors crushed his old club Kitwe United 6–1 in November to lift the Castle Cup, with Chitalu grabbing a hat-trick and taking his tally for the season to 99 goals in a 9–2 whipping of City of Lusaka and only needed one more to reach the magical figure of one hundred goals. The hundredth goal soon came in a 4–2 victory in a league game against Kalulushi Modern Stars at the Independence Stadium in Kalulushi, when he scored a hat-trick. At the end of the season Kabwe Warriors had swept all the silverware on offer, a haul which included the Footballer of the Year and Top scorer awards for Chitalu who attributed his success to the good support of his teammates. 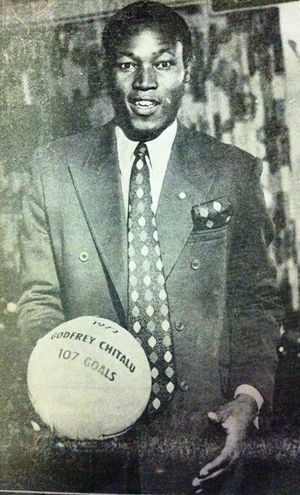 For his remarkable achievement, Chitalu received a special yellow ball from sponsors Rothmans International which had his name and number of goals inscribed on it. He tied for top scorer with Bernard Chanda in the 1973 season, and led the scoring charts as well in 1974. In 1975, he played in a deeper midfield role and recorded his worst tally of goals, scoring less than 10 league goals and Kabwe Warriors ended the season second bottom with 6 wins, 7 draws and 13 defeats and were relegated from the top league. They were however saved when the FAZ decided to increase the number of teams in the Zambian Premier League from 14 to 16. Chitalu was runner-up to Bernard Chanda in the 1976 scoring duel, finishing with 31 goals which was seven less than "the Bomber's". He lost out to surprise winner Vincent Chileshe for the 1977 Footballer of the Year award but was named the country's Sportsman of the Year. He became the first man to win the Zambian Footballer of the Year award in consecutive seasons in 1978 and 1979. In July 1981, Chitalu broke his arm when Warriors beat City of Lusaka 2–1 in a league game in Lusaka when he jumped over a defender's tackle and landed badly. The injury kept him out for the rest of the season. He made a comeback the following year after which he retired from the game at the end of the season. After Lionel Messi was recorded to have beaten Gerd Müller's record of 85 goals in a year, the Football Association of Zambia claimed that the world record actually pertained to Godfrey Chitalu who had scored 116 goals (possibly 117) during the 1972 calendar year and 107 during the 1972 season. The difference of goals is due to first 9 goals being scored before the season officially started. The Football Association of Zambia presented the evidence to FIFA but a spokesperson responded that they would ratify neither Lionel Messi's nor Chitalu's records as they do not keep statistical track of domestic competitions. Nonetheless, it could constitute the highest official tally claimed by a national football association. Chitalu made his international debut on 29 June 1968 in a friendly match against Uganda in Lusaka which Zambia won 2–1. He scored his first goal in a 2–2 draw against the same team five days later. Chitalu was in the team that beat Nigeria 5–1 on 15 July 1973 in Lusaka to qualify to the 1974 African Cup of Nations. He featured for Zambia at the tournament and scored a goal against Egypt in a 3–1 loss. Zambia reached the final which they lost to Zaire after a replay. In April 1975, he was dropped from the national team and he watched the action from the sidelines for almost two years. He made a comeback when Zambia coach Brightwell Banda took charge of the team, coming off the bench to score two goals in a crucial World Cup qualification tie against Uganda on 27 February 1977 in a 4–2 victory in Ndola. He repeated the feat five months later in an Africa Cup of Nations qualification game against Algeria with Zambia trailing 2–0 from the first leg in Algiers. He scored a brilliant brace to force a 2–2 draw and Zambia prevailed 6–5 on penalties. In the month when he turned 30, Chitalu scored 5 goals in the CECAFA Cup which Zambia lost in the final to Uganda on spot-kicks. The following year, Chitalu graced his second Africa Cup of Nations at Ghana 1978 but Zambia lost him to injury in the first game and were eliminated in the first round of the tournament. He made another impression at the CECAFA Cup in Uganda where he finished top scorer with a record 11 goals, including 3 in a 9–0 thrashing of Kenya and 4 in a 4–0 defeat of Uganda. Zambia however lost to Malawi 3–2 in the final. In 1980, he represented Zambia at the 1980 Summer Olympics, scoring a goal against the Soviet Union in a 3–1 defeat. He also scored when Zambia lost to Venezuela 2–1 He played his last game for Zambia on 12 December 1980 against Kenya in Nairobi which Zambia lost 2–1. It was his 108th appearance making him Zambia's most capped outfield player and record top scorer with 76 goals. "Zambia will bring home the World Cup one day or at least a continental one. But we must accept that these things might take a life-time. However, it is worth the wait." Chitalu got involved in coaching as early as 1975, when he served as assistant player-coach at Warriors. In 1978, he was named interim national team coach for a two-match trip to Swaziland which Zambia comfortably won 6–1 and 5–2. After retirement, he was appointed assistant coach at Warriors under Ilija Lukić. On 16 October 1983, Warriors were trailing to Nkana Red Devils in a league match at Railways Stadium. According to reports, Lukić was first sent to the stands, and Nkana were later awarded a penalty in the 75th minute of the match. In the ensuing confusion, Chitalu rushed onto the field as if to talk to the referee and suddenly punched him in the face. This led to the game being abandoned. The club acted swiftly by removing Chitalu from his post and banning him from football activities for a year. Although he denied attacking the referee, the FAZ meted out an even heavier punishment when they banned him for life and Warriors were fined and docked points for the abandonment of the game. It seemed like an ignominious end for the famed goal-king but his club mounted an appeal and the life ban was lifted and replaced by a two-year probation period and a fine. The FAZ stated that "in view of Chitalu's outstanding contribution to the Zambian game," he was being given another chance. Later that year in October, Warriors dismissed veteran coach Lasky Mwandu and appointed Chitalu in his place and Warriors won the Independence Cup. After a seventh-place finish in the 1985 season, he led Warriors to third place in the league in 1986 but was surprisingly replaced by Bizwell Phiri who went on to win the 1987 league title. In October 1987, he was appointed Administrative Manager for the national team and the following year, Zambia qualified to the 1988 Seoul Olympic Games after a nerve-wracking 2–1 aggregate win over Ghana. After winning the first leg 2–0 in Lusaka and Ghanaian fans predicting a 5–0 whitewash in favour of their team in the return leg, Zambia conceded an early goal in Accra and despite intense Ghanaian pressure, held on to proceed to Seoul. Chitalu called the 5 minutes added time 'the longest five minutes of his life.' Although he was left out of the Seoul contingent which made an impression with 4–0 victories over Guatemala and Italy, he bounced back in the same position after the tournament. Later that year, Chitalu received an honorary diploma for Fair Play from the International Fair Play Committee at the awards ceremony on 3 November 1988 in Paris, after he came out second to Indian tennis star Vijay Amritraj in a poll to honour some of the world's most outstanding sports personalities. In 1990, disaster struck when Warriors were relegated and coach Jack Chanda was fired. The club called on Chitalu to lead them back to the top league and he obliged by first ensuring that none of the club's top players left to join other clubs. Warriors set a blistering pace in Division I which led to a swift return to the Premier League. They also won the Challenge Cup after a resounding 7–0 defeat of Konkola Blades and the Champion of Champions Trophy through a 2–1 win over Nkana Red Devils. Eyebrows were raised when Chitalu, the coach of a team in a lower division was rewarded with the Coach of the Year trophy, ahead of Freddie Mwila of Power Dynamos who had won the Premier League and African Cup Winners' Cup double. Following Zambia's surprise defeat to Madagascar in a World Cup qualification tie in Antananarivo in December 1992, coach Samuel Ndhlovu was sacked and Moses Simwala was named the new Zambian coach with Chitalu and Alex Chola as his assistants. However, Simwala fell ill before he could take charge of the team and Chitalu was appointed head coach. Zambia were tipped to make it all the way to the 1994 World Cup, but on their way to Senegal the team met its fate in the horrific air disaster off the coast of Gabon. Chitalu had a record of 4 wins, a draw and 1 loss with 13 goals scored and 3 conceded. Chitalu married Christine Chibale in October 1972, in between two matches against Ghana's Hearts of Oak in the African Cup of Champions Clubs. They had eight children and his son Dennis also played for Kabwe Warriors in 1992. Godfrey Chitalu's grave in Lusaka. On 27 April 1993, the Zambia national team travelled to Senegal for the first of their 1994 FIFA World Cup qualification games in the group stage. The team's mode of transportation was a Zambian Air Force plane. After refuelling in Libreville, Gabon, the plane developed problems and plunged into the sea. Thirty people on board including Michael Mwape, the president of the FAZ, Chitalu and eighteen players died in the accident. Godfrey Chitalu Road in Lusaka is named after Chitalu. In December 2012, Kabwe Warriors renamed the Railways Stadium as the "Godfrey Chitalu Stadium," and announced plans to erect a statue in his honour. Data presented by the Football Association of Zambia regarding the 1972 calendar year and the 1972 season suggests Chitalu could be holder of world records such as most official goals in a year and most official goals in a season. Alternatively Spanish historian Guillem Pons claim that at most 88 of those goals could be official. Pons amongst others excluded goals scored in the Charity Shield and the Chibuku Cup, indirectly basing his assumptions on the fact that the website of the Zambian FA makes no direct reference to these tournaments. These claims are contentious at best, as, for example, brief research of the subject shows that the Charity Shield is currently a tournament administered by the Football Association of Zambia as a season-opening trophy, similar to the English FA Community Shield. Zambian historian Jerry Muchimba responded to these claims with news clippings, additionally atesting that: "The Castle Cup, Challenge Cup and Chibuku Cup were all official knock-out cup competitions and had been in existence from the time the league started. The Charity Shield was introduced in 1967 and is still in existence today though it is now called the Samuel “Zoom” Ndhlovu Charity Shield, after another iconic footballer." ↑ Muchimba, Jerry. "Godfrey 'Ucar' Chitalu". Matador, 2015. Godfrey Chitalu – FIFA competition recordLua error in Module:WikidataCheck at line 22: attempt to index field 'wikibase' (a nil value). This page was last edited on 30 September 2016, at 16:31.